Recent release “The Adventures of Pugsley the Pug and Trucker Joe: Lost in Maine” from Page Publishing author Carmen Oliva is the charming story of a friendly trucker and his adorable pug who follows a strange creature into the woods of Bangor, Maine and ultimately learns how friendship can grow in the most unlikely of places. Carmen Oliva, a wife, mother and pug owner, has completed her new book “The Adventures of Pugsley the Pug and Trucker Joe: Lost in Maine”: a charming story about Trucker Joe and his trusty companion, Pugsley the pug, who follows a moose into the woods of Bangor, Maine and finds himself lost and alone. He must learn to trust the moose, who guards him from a passing storm, provides food and shelter and ultimately leads little Pugsley back to Trucker Joe and the Big Blue Truck. Published by New York City-based Page Publishing, Carmen Oliva’s whimsical tale is the story of an endearing friendship formed between a pug and a moose deep in the woods of Bangor, Maine. 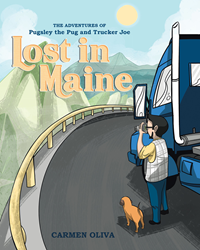 Readers who wish to experience this charming work can purchase “The Adventures of Pugsley the Pug and Trucker Joe: Lost in Maine” at bookstores everywhere, or online at the Apple iTunes store, Amazon, Google Play or Barnes and Noble.